The food at Boris Yeltsin’s dacha was awful. So says Shelly Saltman, who played tennis with Yeltsin on a visit to the Russian leader’s Black Sea retreat when Saltman was there promoting cellular technology. “Yeltsin was my doubles partner,” says Saltman. “We never lost.” Saltman is UMass Amherst’s very own Zelig. In an extraordinary career as a promoter of athletes and entertainers, he worked and socialized with a plethora of famous people and was in on the beginnings of satellite TV, plastic credit cards, home video, and cell phones. Thomas P. “Tip” O’Neill Jr., the congressman from Massachusetts and longtime Speaker of the House of Representatives? He was Saltman’s godfather. The musical duo Sonny and Cher? Saltman knew them when they were billed as Caesar and Cleo. Actor Leonard Nimoy? His father, Max, was Saltman’s barber in Boston. Volatile Yankee’s coach Billy Martin? He was once Saltman’s roommate. Muhammad Ali? Saltman was his worldwide promoter and publicist. The singer Andy Williams? He was Saltman’s business partner and dear friend. Hockey great Wayne Gretzky? Saltman was his personal manager in the United States when a very young Gretzky was playing in Edmonton; they remain friends. Over a recent lunch at Brent’s delicatessen, outside of Los Angeles, Saltman downplays his achievements, “I was one of the lucky ones,” he says. Like the fictional Zelig, “I was always in the right place at the right time.” But even at age 85, it’s clear that Saltman’s love of the game—whether the game was sports, entertainment, or business—propelled those close connections with so many 20th-century bold-faced names. Saltman’s been reminiscing lately as he finishes his 10th book, the memoir Excerpts from a Full Life. “It’s about intrigue, celebrities, mobsters, dictators, governments, and love,” he says. He arrives for lunch wearing a UMass jacket over a Red Sox shirt. He’s a bit tired, having stayed up late the previous night watching the NCAA basketball tournament with his grandson. Nevertheless, he radiates energy as he talks about his UMass days, his colorful career, and the famous people he’s known, skipping around, Shelly-style, from story to story, friend to friend. He’s proudest of bringing the Harlem Globetrotters to campus to play against UMass basketball coaches in “Shelly’s Spectacle,” which raised $6,000 for cancer research. “Later, I represented Meadowlark Lemon [a Globetrotter star], and we became friends.” But back to UMass . . .
Saltman has a good word for almost everyone who crossed his long path. Between shows, he earned a degree in political science and then served in the U.S. Army at the end of the Korean War. That’s when Billy Martin was his roommate. “We got along great,” he says. “I was the designated driver.” Saltman quips that he carried a microphone in the war, serving as a sports announcer and radio broadcaster for the military’s Far East Network. “You remember Robin Williams in Good Morning, Vietnam? I was ‘Good Morning, Korea.’ The big difference was that he was talented and I wasn’t.” Saltman then returned to Boston where he earned both a master’s degree in public relations and a law degree with help from the G.I. Bill and Mollie, his wife of 51 years. While attending night school, he went to work in radio and television broadcasting for Gillette Cavalcade of Sports. At this point, Saltman’s career took off, bringing him all over the United States and to 52 countries. His life became so eventful, that a deli lunch allows time for him to relate just a few of his decades of anecdotes. 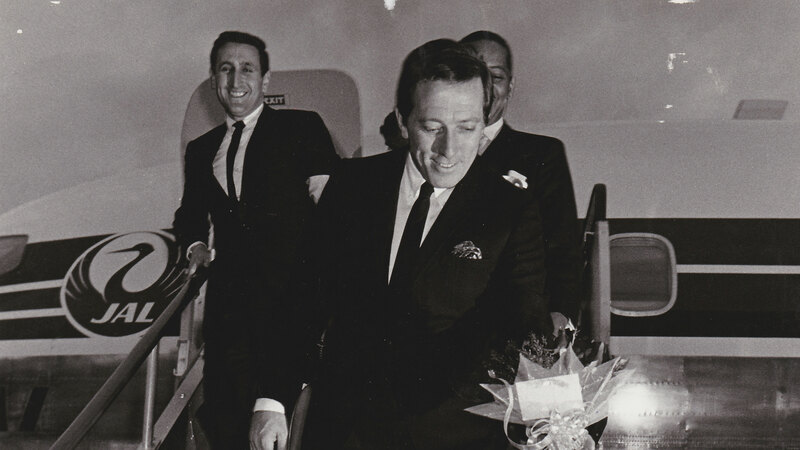 Shelly Saltman (at left) with Andy Williams. Returning to sports promotion, Saltman coordinated the world-wide closed-circuit presentation of the epic Ali-Frazier fights. He was also the man behind the scenes at Ali’s 1976 bout with Japanese wrestler Antonio Inoki. The two fought to a draw—Ali punched and Inoki kicked. Afterward, “Ali almost died of blood clots in his legs,” Saltman recalls. “That’s one I regret. He was one of my all-time favorite people.” Saltman worked for Jack Kent Cooke, owner of the Los Angeles Lakers and Los Angeles Kings and learned to run major league fran-chises. He made countless deals for Lew Wasserman at Hollywood’s MCA. He eventually joined IMG, run by legendary sports agent Mark McCormack, for whom the UMass Amherst Isenberg School of Management’s department of sport management is named. Saltman laughs remembering his 1970s reign as the “king of junk sports.” He was behind Battle of the Network Stars, orchestrating televised matchups, like a race between Robert Conrad and Gabe Kaplan and a tennis match between Farrah Fawcett and Björn Borg. He cocreated Celebrity Challenge of the Sexes, pitting Elliott Gould versus Brenda Vaccaro in basketball and Ed Asner versus Lola Falana in a marathon. 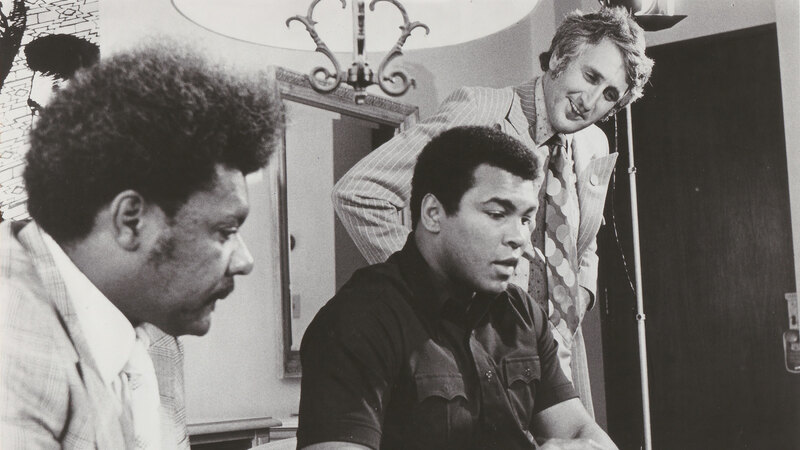 Shelly Saltman (at right) with Muhammad Ali and Don King. He takes particular delight in recounting that in 1984, he was co-commissioner of boxing for the Los Angeles Olympics, and took the opportunity to convince the International Olympic Committee to allow women to run an Olympic marathon for the first time. Saltman after being assaulted by Evel Knievel. Knievel roared a rocket-powered motorcycle up a long ramp faster than 300 miles per hour and soared over the canyon floor. But his parachute opened prematurely, and he and the cycle drifted anticlimactically to earth before he reached the far side of the canyon. The stunt was a letdown for the public, while Knievel earned $6 million. “I heard later that he never read the book,” recalls Saltman, “but he didn’t like that I called him an S.O.B.” Knievel came to the 20th Century Fox lot where Saltman was the first president of Fox Sports and went after him with an aluminum baseball bat. Saltman ended up in intensive care with two smashed arms.